Welcome to the Empower Your Consciousness page offering you my view of how Your Consciousness works based on many years of hosting experiential personal transformation retreats. I also acknowledge the profound inspiration Dr David Hawkins M.D.,Ph.D. provided through his work “Power vs Force”. Consciousness is a subjective experience which we experience through our perception and awareness - perception relating to how we interpret things going on outside ourselves, awareness relating to what is going on within. We all have it, we all live with it and it is the single most influential factor which determines our experience of life. Learning to use your consciousness is - for me - the most potent way anyone can change their life to make it what they want it to be. The degree of empowerment of a consciousness can be considered as a measure of the degree to which that consciousness is creating a life experience that they enjoy. It easier to start with an analogy you are hopefully familiar with - light, an energy which we see or perceive with our eyes. A physicist will describe light as a small part of the spectrum of electromagnetic energy which includes parts we can feel but not see - such as infrared and untraviolet - and a lot more we can't see or feel but which can affect us drastically such as x-rays, gamma rays and microwaves. This image show how the electromagnetic spectrum is arranged - the higher energies at the top. 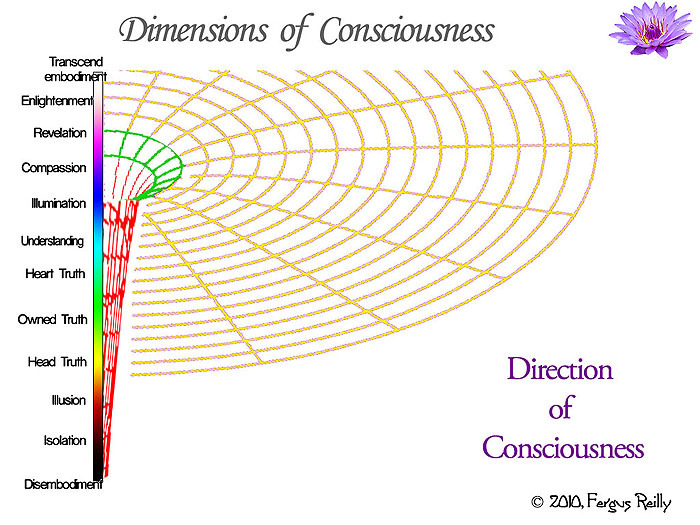 Consciousness is much the same - I see it as a spectrum of states - or levels - of which we perceive just a small portion. The part I am talking about is the portion of consciousness we can experience - the part which corresponds to the portion of electromagnetic energy that we can see. It is indicated by the white stripe in the middle of the grey background. This part of consciousness is the bit we can use, be aware of, feel or experience while we are alive - being in a body or embodied. I believe that you have to leave your body to experience levels of consciousness outside that segment (so there seems little point in speculating about it’s nature here). That is because the human body can only operate (or sustain itself) within that region of vibration - if the vibration slows or lowers beyond the lower boundary - the body stops working and death occurs. If the vibration quickens or rises above the upper boundary - the body cannot keep up and our awareness leaves its “earthly container” - if it is a permanent departure then the body will expire from lack of a pilot. At the bottom is the lowest level we can experience as a living human being, I'll call this death. Moving down beyond this level is the “descent into hell” style of dying. It is the lowest level our consciousness can descend to while continuing to operate a body, below that human life cannot be consciously sustained as we know it and the body ceases to function (dies). Above that are ascending levels of consciousness - I am not suggesting that one level is superior to another; however the experience of life at a higher level is - in my experience - most definitely superior to the experience of life at a lower level. At the top the intensity of light is white and we come to a level where the human form has reached the limit of its capacity to act as a vehicle for consciousness - this is where consciousness transcends embodiment. “Death” is equally applicable here but this is the “ascent into heaven” version. To see more detail about the various levels within this dimension, just run your mouse over the spectrum scale. I have used the lables created by David Hawkins in his wonderful book “Power versus Force” to identify divisions or levels within consciousness - the comments and descriptions are my views. That doesn't really say much about empowerment - so far it has dealt with raising consciousness to a higher level or state. To discuss the power of consciousness we need to take a look at what it is that imbues consciousness - at any level - with power. Now a look at a second dimension of consciousness - the dimension of empowerment, a measure of our potency, our capacity to consciously manifest or create reality the way we want to experience it. This dimension measures strength and is perpendicular to the Level of Consciousness axis. The scale is infinite - unlimited, as many sources agree. 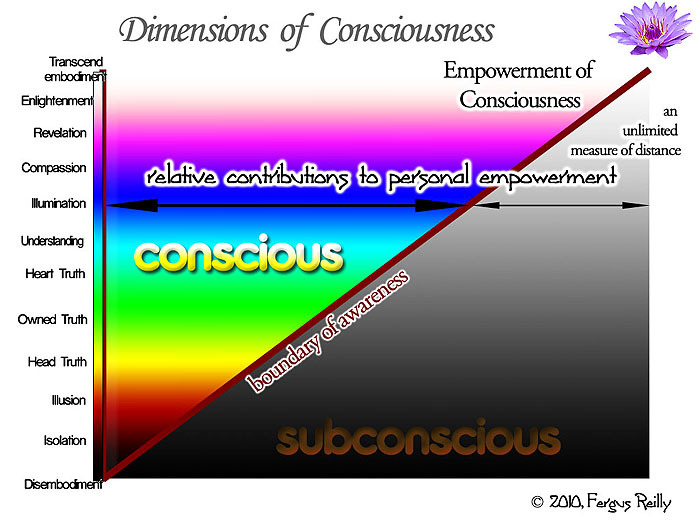 The relationship between the level of consciousness and the empowerment of consciousness is shown - at this point by the line labelled “boundary of awareness”. It indicates the relative degree of conscious empowerment attainable at the level of consciousness. It also serves to illustrate the ratio between our ability to consciously create the reality we experience and the degree of subconscious (or unconscious) control of our life. Personally, I do not see the boundary of awareness as a straight line - it is a curve which extends from zero to infinity. Now it becomes apparent how significant our level of consciousness is when it comes to creating our lives and living - our “reality”. It is also quite illuminating about the degree of control our subconscious exerts over us while our level of consciousness remains “below the line” - the level of courage. 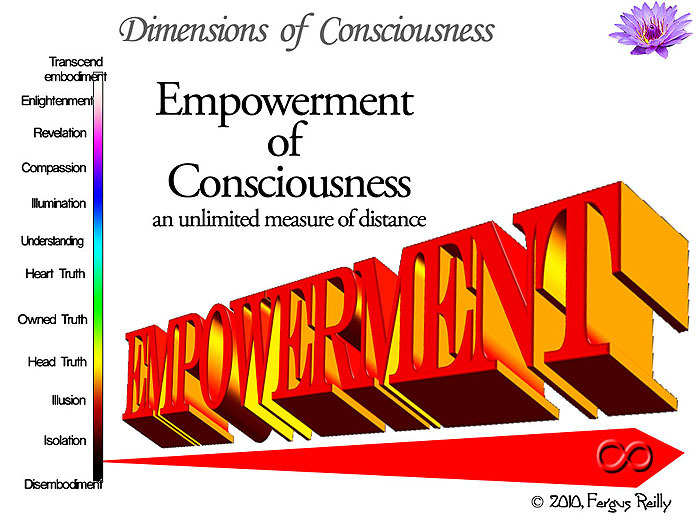 This “empowerment contour” indicates the degree of empowerment attainable at any particular level of consciousness. The way we attain that maximum available degree of conscious empowerment is with passion. The terms “consciously empowered” and “passionate” are - for our purposes, similar - people who are passionate about what they are doing are operating with as high a degree of conscious empowerment as their passion demands or provides. This may be anywhere within the range available at their level of consciousness. If we desire power - true personal power within ourselves and not the illusory worldly power measured by external symbols of status or our ability to force others to bend to our will - raising our consciousness is the first step, becoming passionate is the next. Which leads us to the third dimension of human consciousness: how does one get passionate? This dimension is about direction. All directions are equal in consciousness and the directions are as diverse as human interests - consciousness thus expands in all directions. Plotting this as a - now 3-dimensional - image forms a fascinating image. 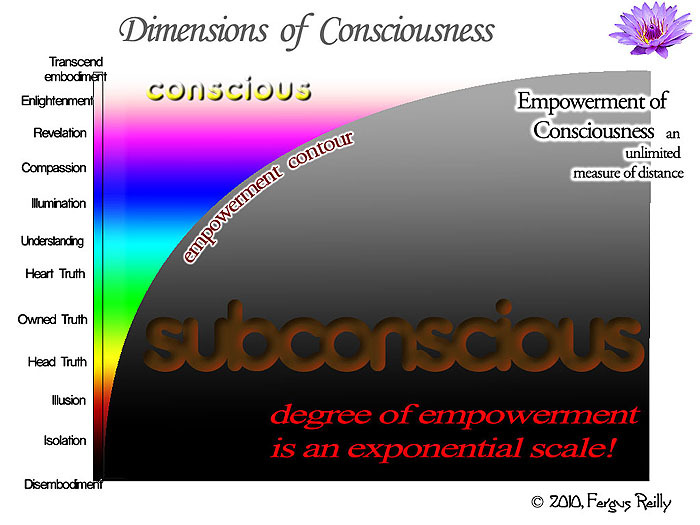 Rotating the “empowerment contour” about the vertical axis of the level of consciousness creates a three-dimensional surface. 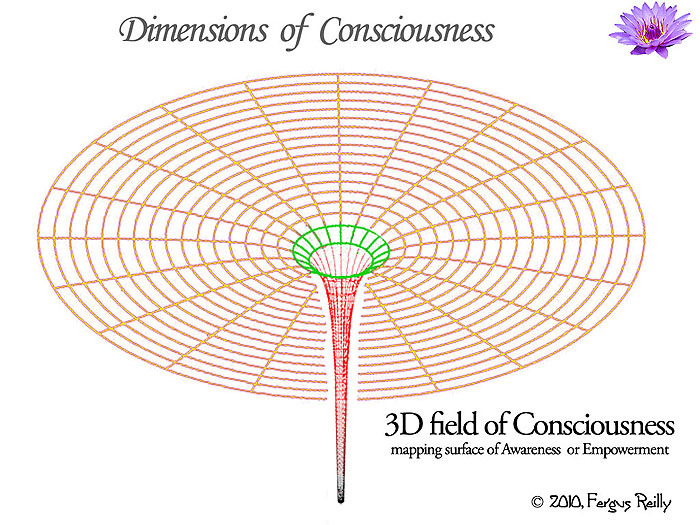 A surface of conscious awareness or empowerment - the 3 dimensional representation of human consciousness. It looks remarkably similar - to me - to the gravity field of a black hole. Using the analogy of a black hole: the rite of passage or baggage barrier (level of courage) relates to the event horizon of a black hole. We see human consciousness as having 2 principal event horizons (the above diagram shows only one). The first is at the level of courage - it represents the Rite of Passage from unconscious living to conscious living. The second is at the level of Reason, where we need to relinquish our dependence on “knowing how things work” as a validation of our individual existence in order to ascend further. These barriers are the major obstacles which prevent much of humanity from attaining their “highest potential”. An example of what one can achieve with an empowered consciousness is my work creating a software application called CyberSayer®. We set out to create a program which could divine what was of significant concern within a person's consciousness or awareness- and which could offer them help or support in dealing or coping constructively with the experience. Within 2 years we had a working prototype of a program that did just that - achieved by raising my consciousness to a level around illumination/Love when designing and coding. When the Internet came along it was a while before we wondered if it would work over the internet - it was more of a curiosity at first. It worked similarly effectively throughout a 5 years research phase. This seemed a major obstacle - we had developed an “understanding” of how CyberSayer might work which was built upon our “understanding” of computer hardware and software. And it really would not explain the phenomenom. The thing we found so challenging to come to terms with was that one computer - in Sydney, Australia - could discern, with apparent equal effectiveness, the subjective concerns of folks all over the world. And it was all happening on a server that was simultaneously dealing with requests for around 300 other websites. You can see some of the feedback I was getting around that time on CyberSayer's old site (I've left it there as a sort of museum piece of digital consciousness research). Dr David Hawkins' work “Power versus Force” exposed me to the notion that the limit of reason was about half way up the scale of human consciousness. The need to understand appeared to be a second rite of passage - between adulthood and elder hood if you like. Attachment to understanding and reason would prevent further progress. It seemed that, having operated with a level of consciousness above that of Reason, we had created something which also operated beyond Reason. We returned to developing CyberSayer with the view of creating a space on the internet where people could investigate their consciousness in peace and safety, free of expectations or judgements with loveing support. It has become much more than a curious consciousness space - it is now a potent space where lives are changed, awareness evolves, gently and empoweringly. The point we are making here is that we created something beyond the limitations of (my) human reason or understanding by working at that level of consciousness. You, too, can achieve your “impossible dream” once you operate at levels of consciousness above reason - the space without limitations. Thankyou for sharing this page - its been a life's journey for me and I hope it has added something of value to your life, here's a link to CyberSayer's website, the button below will take you directly to the subscribe page.